The energy used to heat our homes can come from a variety of sources. If your home uses electricity to power its heating system—such as an electric furnace—you should know a bit about what electrical problems you may encounter and if they will need professional repair. With the summer behind us, now is a good time to start thinking about the needs of your electrical heater in your home. You don’t want a heating failure to leave you without warmth during the cool season. When you need heating repair in Columbus, OH, make Quality Air Heating and Air Conditioning your first place to call. Whenever you experience problems with any of your electrical heating systems, check your thermostat first. It may be set incorrectly, or it could have an electrical fault of its own. A malfunctioning thermostat will prevent you from properly controlling the heat in your home and, it will require professional repair or replacement. Electric furnaces usually have few maintenance needs, but they will eventually start to wear down and need attention. If your electric furnace shuts off, first check your circuit board to see if any of the breakers have been tripped. Leave the furnace off for 30 minutes, then hit the “reset” button on the unit. If the problem is an overloaded motor, this should fix the trouble. If the problem continues to occur, your furnace may be the wrong size for your home and is constantly overworked. Get an HVAC specialist to perform a heat load calculation to determine if getting a different sized furnace will solve the problem. If you notice a decrease in the warmth coming from your furnace, the issue may be with the heating elements. Electric furnaces use an array of heating elements that turn on in stages. As your home requires more heat, additional elements will turn on. If one or more of these fail, the heater will lose power. Any problems with electricity and your heating system should be approached with extreme caution. If you are inexperienced with working on electrical systems, trying to fix a problem with your heater carries a potential for a high voltage shock. Don’t risk your safety trying to repair the problem yourself. Call on heating experts like those at Quality Air Heating and Air Conditioning. 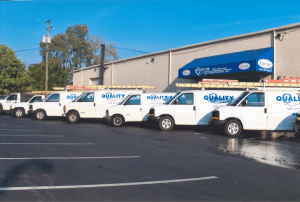 We provide high-quality heating repair in Columbus and service to all of central Ohio.